A rather braggadocios look at the various autographs and game-used memorabilia I have managed to acquire, either in person or through the mail. It's a good thing I'm a Minnesota Wild fan, as the team seems to be one of the best for through-the-mail autographs. Of course, not everyone signs as much as some of the others do, but some of the bigger names, like defenseman Ryan Suter, are great at returning TTM requests. 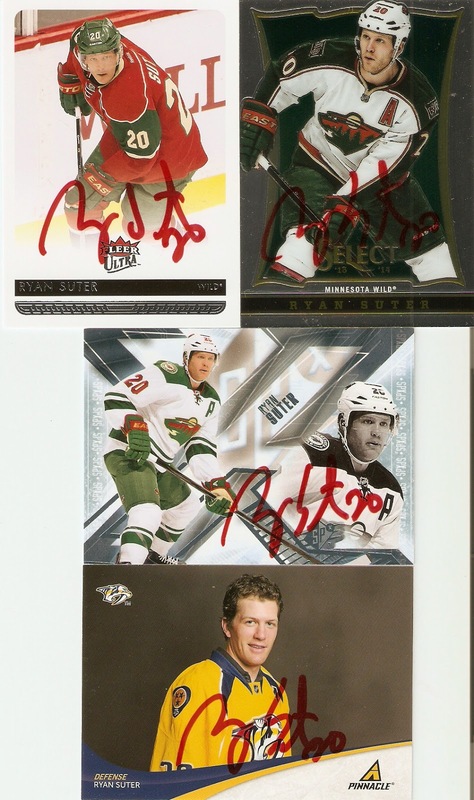 I mailed four cards for Suter to signs, and he returned them to me in just 21 days. It may seem like more than enough time for an in-state TTM request, but considering that Suter is one of the team's most well-known stars, it came back to me very quick. Suter signed each card in a red Sharpie, which doesn't always work with certain cards, but considering red is one of the Wild's colors, it actually looks really nice.